When the Solent is on form it truly is one of the world's great sailing venues and today's conclusion of the 2015 Vice Admiral's Cup, hosted by the Royal Ocean Racing Club incorporating the Royal Corinthian Yacht Club, demonstrated this perfectly. As forecast the day opened with light airs and overcast skies so Race Officer Rob Lamb initially held the crews ashore giving them time to enjoy a relaxed Sunday morning coffee. By noon the sun was out, a classic Solent sea breeze was building from the south west and racing was underway for the first of two windward leewards for all classes, races eight and nine of the series. The Quarter Tonners were as tightly packed as ever and arrived at the first mark of race eight en-mass. With a strong ebb tide running there were some close judgement calls to be made as they rounded the spreader mark and gybed back into the Bramble Bank to get out of the tide. In the melee several boats including Tony Hayward's Blackfun and Julian Metherell's Espada found themselves infringing and were forced to make penalty turns as the rest of the fleet streamed off downwind. Although they did their best to make up lost ground they were unable to recover and finished the race 11th and 10th respectively. Up ahead of them Rickard Melander's Alice II was romping to race victory with Louise Morton's Bullit, being helmed by Collette Richmond, second and overall leader Aquila owned by Sam Laidlaw third. Going into the final race Aguila held a four point lead over Alice II with Blackfun third and Bullit fourth. Bullit threw everything they had into the final race and were rewarded with their first victory of the regatta, beating Eric Reynolds' Magnum Evolution by 16 seconds. A further 16 seconds separated third to sixth place with Aguila, Blackfun, Alice II and William McNeill's Illegal Immigrant finishing in that order on corrected time. In the overall standings Sam Laidlaw and Aquila claimed victory by six points from Alice II with Blackfun third and Bullit fourth. In the SB20 class Forelle Estates owned by the Llewellyn/Wakefield/Vigus partnership added an eighth win to their score card to claim an impressive straight bullets overall victory. While Forelle Estates elected not to take part in the final race, the fight for second and third places was still very much on. Charles Sheppard's Sharc went into the day in second and rounded the first mark of race eight in third place, but on hoisting it their spinnaker ripped around the tapes. They managed to cling on and finish fifth but it left them on equal points with eDigital Research, owned by the Russell/Westlake partnership, going into the last race. The two boats were neck and neck all the way round the course but on the line it was Sharc that claimed victory and the second step on the podium by just a single point from eDigital Research. Tony Mack and his crew aboard J/111 McFly were once again on flying form and took a very confident win in race eight to secure the series. They were enjoying the racing so much that they stayed out for race nine and cruised to third place which they promptly discarded as their worst result. Stuart Sawyer's Black Dog secured second place overall by taking third in race eight and second in race nine to finish the series eight points behind McFly. The battle for third was a close one with Mustigo, owned by the Scholefield/McDonald/Thomas partnership, Andrew Christie and Chris Body's Icarus and Martin Dent's JElvis separated by just a single point going into the final day. Mustigo declared her intentions from the off and finished race eight in second place, with Icarus fourth and JElvis sixth. As they lined up for the final race Mustigo now counted 27 points, Icarus 30 and JElvis 32. Mustigo had the bit between her teeth though and stormed to race victory to secure her place on the third step of the J/111 podium. Asked after racing for the secret of their success Tony Mack, owner of McFly wryly said: "Firstly it was lovely weather, it didn't rain! Also I think we just got lots of things right, which in the past we haven't always. We seemed to get the rig settings right for each race, the sails. the wind shifts and we just got further and further ahead. Jeremy Smart is our tactician and he got us simply brilliant starts in all but one race. I think in fairness to the other competitors we've done it where we've got everything wrong. I think that's why everybody goes sailing to hope that they get a weekend like this, one where everything just comes together. "Our class rules allow us one professional, which is Jeremy, but everyone else is an amateur. We're quite a small crew physically, so we can sail with nine people within the weight limit and the crew range from a student, an IBM Executive and a windsurfing instructor to my wife and various friends. We've sailed together a lot which I think is half of it and we make sure the boat is one that everyone likes to sail on so they want to come back." In the J/109s Ian Nagle's Jelly Baby put the final stamp on their already impressive lead by adding a third followed by a win to secure first place overall. While the victor was a foregone conclusion the same could not be said of the remaining podium positions with just four points separating Robert Stiles' Diamond Jem, Paul Griffiths' Jagerbomb, the RNSA's Jolly Jack Tar, Tony Dickin's Jubilee and David Rolfe's Shadowfax overnight. The tension was palpable as the boats came to the line and it was nip and tuck from start to finish of race eight. Shadowfax took her first race victory of the series and was followed across the line by Jagerbomb, Jelly Baby, Jubilee, Diamond Jem and then Jolly Jack Tar. A quick recalculation of the points revealed that Jagerbomb now lay second on 23 points, Shadowfax and Jolly Jack Tar were both on 26 points and Jubilee and Diamond Jem both had 27 points. Right from the final warning flag the boats were jockeying for position and there was plenty of place changing on every leg of the course. At the line Shadowfax crossed second behind Jelly Baby, Jubilee was third and Jagerbomb fourth. Jolly Jack Tar could only manage an eighth, their worst result of the series, and Diamond Jem was ninth. Overall that meant that Jagerbomb took second place overall by a single point from Shadowfax with Jubilee fourth, Jolly Jack Tar fifth and Diamond Jem sixth. 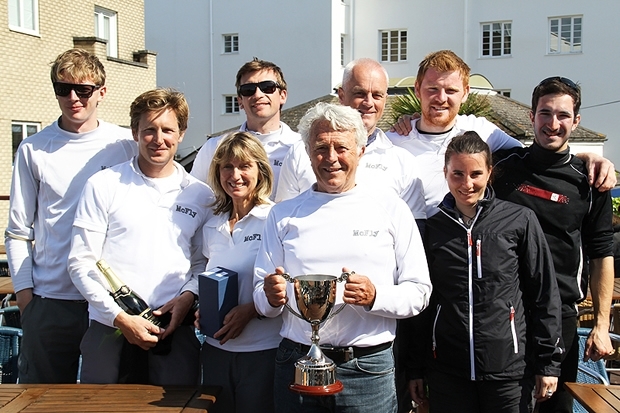 Having travelled all the way from Cork to compete in this year's Vice Admiral's Cup regatta Jelly Baby's owner Ian Nagle said he was "Pleasantly surprised." with their success: "We've done pretty well in Ireland, we've won a couple of ICRA Nationals in 2012 and 2014 and we won the Irish J/109 Nationals last year, but this is our first time out of Ireland. We've come from Cork and are staying to do the J-Cup as well. We genuinely didn't know how we would fare against the English boats. "There are no J/109s in Cork, so we weren't sure how we were going to do, but I think after race 3 we felt might be on the pace. We were very happy with the race management. That kind of fast turn around was great, its lovely to race and start again quickly, that's what its all about really. He [Rob] did a great job as there was so little wind on Friday so to get the three races in that day was magic. We were full of praise for him. After that we're mad for more!" After racing the crews gathered at the Royal Ocean Racing Club's delightful Cowes clubhouse for the prizegiving where RORC Admiral Andrew McIrvine presented the prizes to the luck crews and thanked all the competitors for attending and once again making the Vice Admiral's Cup a resounding success. He also paid tribute to Rob Lamb and his Race Committee for their sterling work and thanked the club's volunteers and staff for their excellent support.